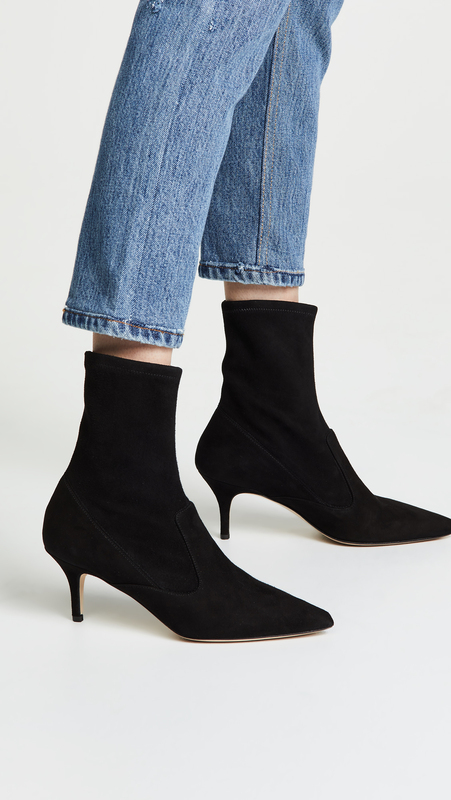 Sock booties like these are having such a moment that they’re already over for all I know, but I like how streamlined they are. Another sock bootie, this one with a nice, nubby texture. 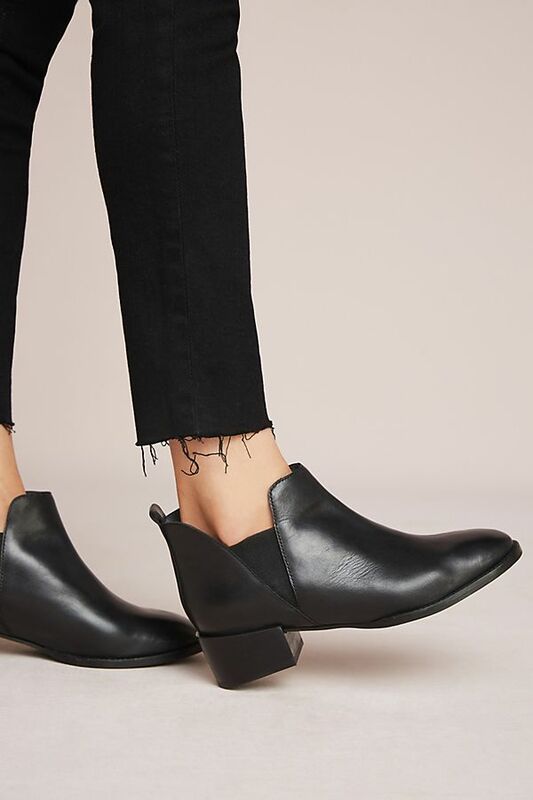 The proportions on these are all off—that itsy kitten heel with the clunky sole—in a way that really appeals. These seem like they’d just be an excellent walk-around-the-city pair. 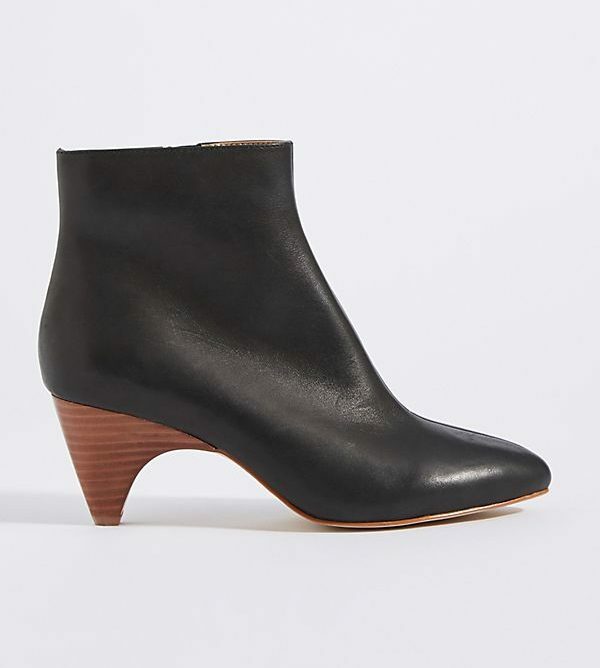 The shape of the wood heel here is subtly sculptural. 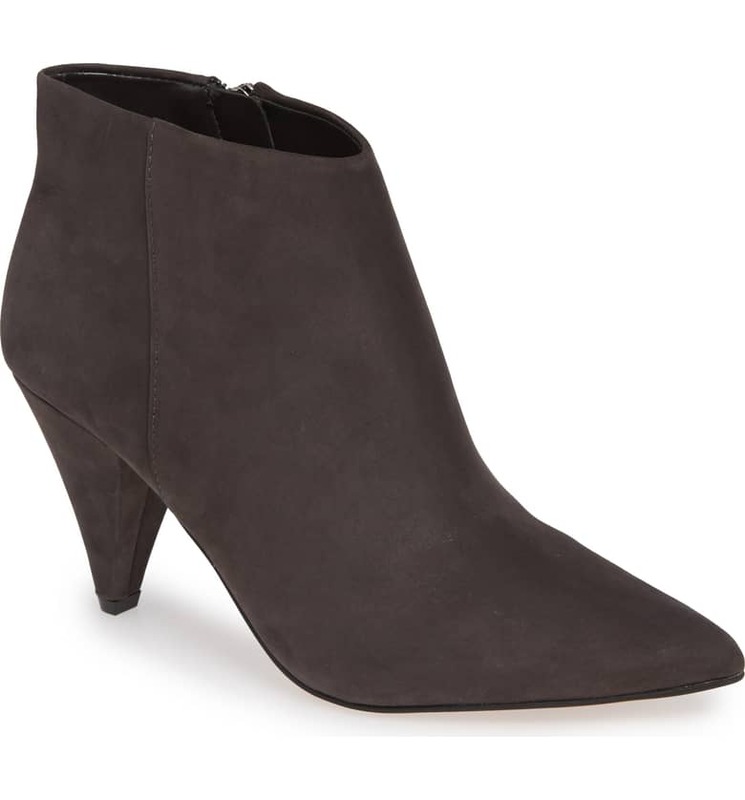 This bootie also comes in black, but I love the deep grey: really sophisticated. I also dig the cone heel. 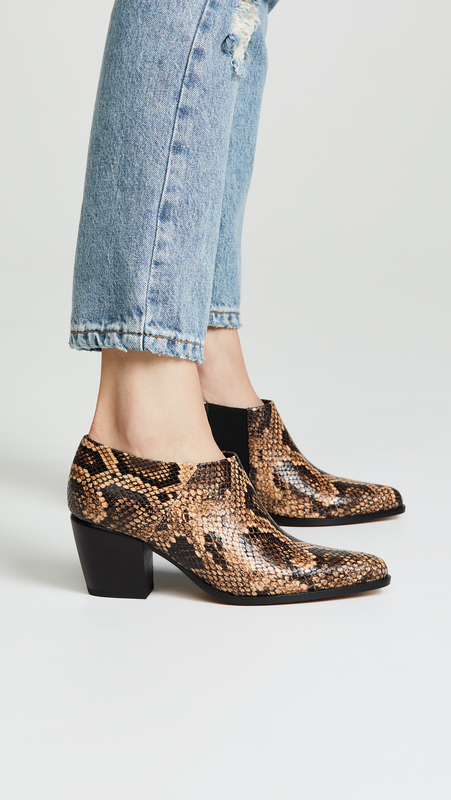 This embossed snakeskin pair is just a kick. Just a really well-priced option. I like that these are the color of tomboyish desert boots, but have such feminine details. This zip-front choice is so excellently mod. The shirring here dresses these up a bit. 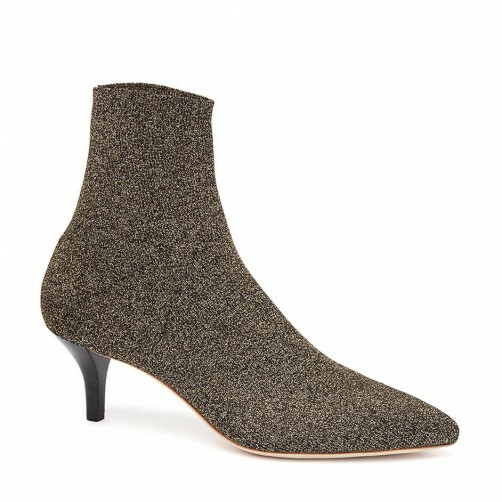 A near-microscopic heel on a very elegant boot. 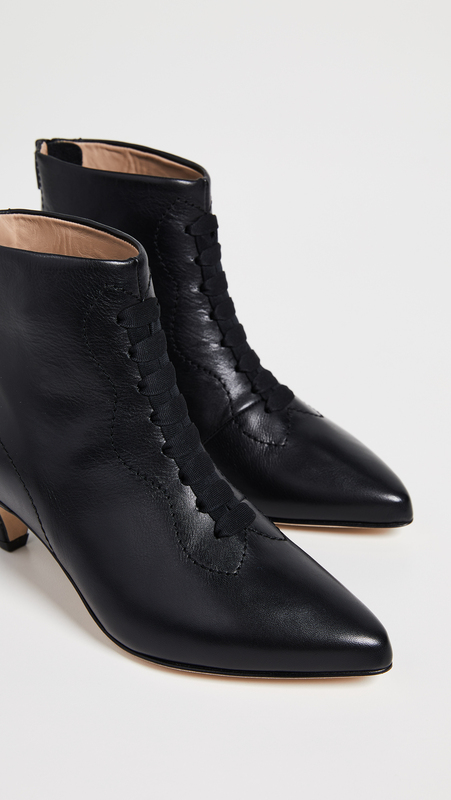 I always feel like I’d look like a guy if I tried to pull off lace-up boots, but these make it look do-able. These look just like something Debbie Harry would have worn around 1981. And yet another sock bootie—in such a cool colorway. I think we can all agree that Acne’s pistol bootie is a classic. 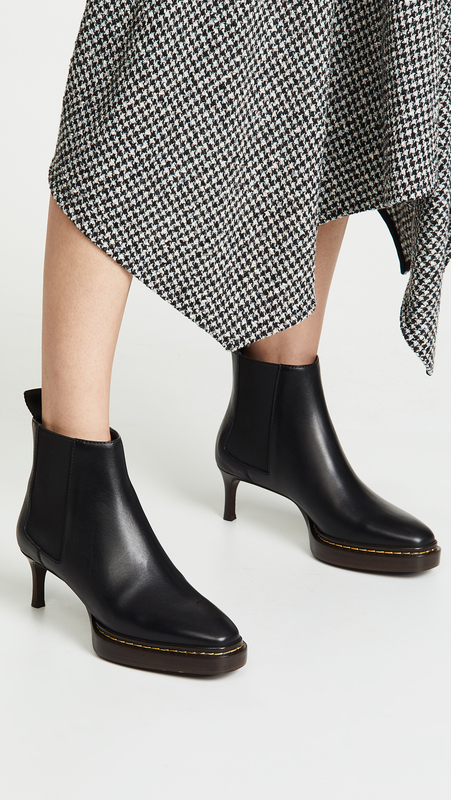 As is Rachel Comey’s Mars bootie. I live in booties for three months out of the year, mostly because most tall boots don’t fit my wide-ish calves. I’ll echo ceejay’s comment about the wearability, comfort, and versatility of the Dicker. I have a pair in olive suede and in regular black leather. Always good deals on them on eBay and The Real Real. 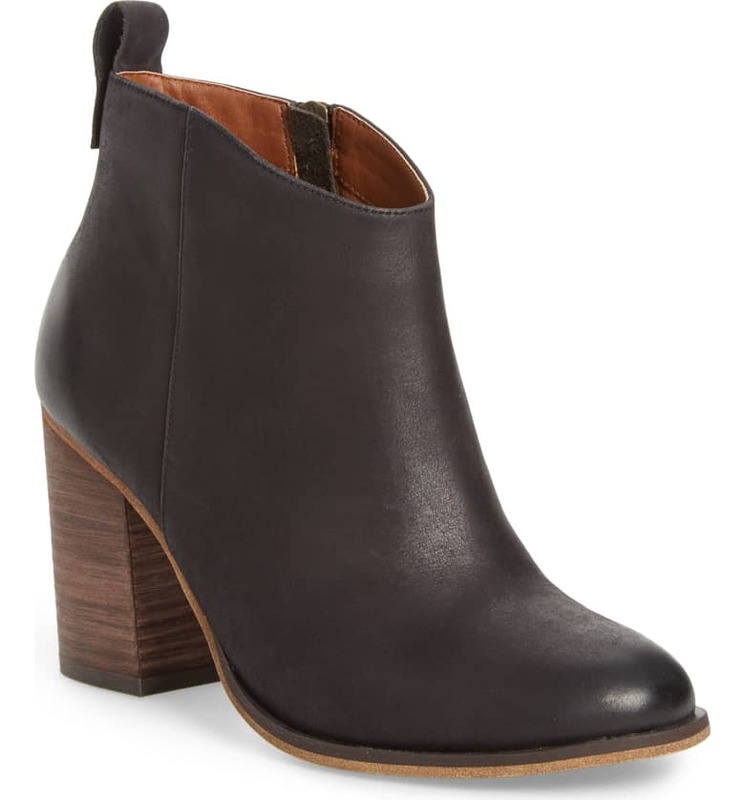 I also like many of Frye’s bootie offerings—I have a basic black pair with a chunky heel and a western-style in a deep cognac. Both are super comfortable. I live in booties for three months out of the year, mostly because most tall boots don't fit my wide-ish calves. I'll echo ceejay's comment about the wearability, comfort, and versatility of the Dicker. I have a pair in olive suede and in regular black leather. Always good deals on them on eBay and The Real Real. 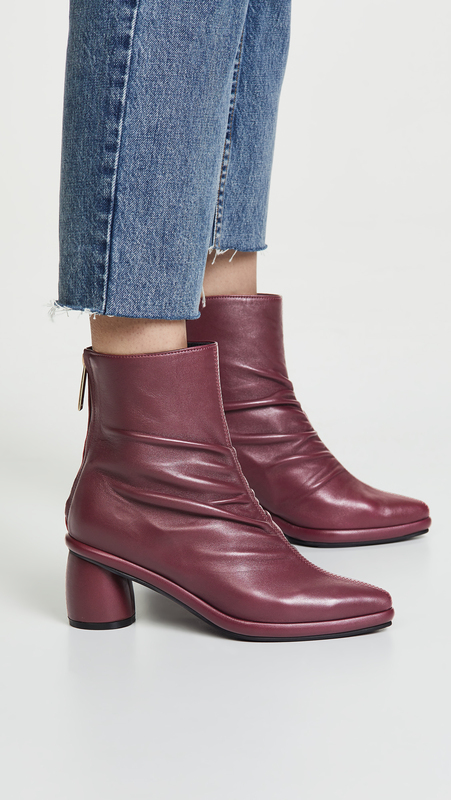 I also like many of Frye's bootie offerings—I have a basic black pair with a chunky heel and a western-style in a deep cognac. Both are super comfortable. 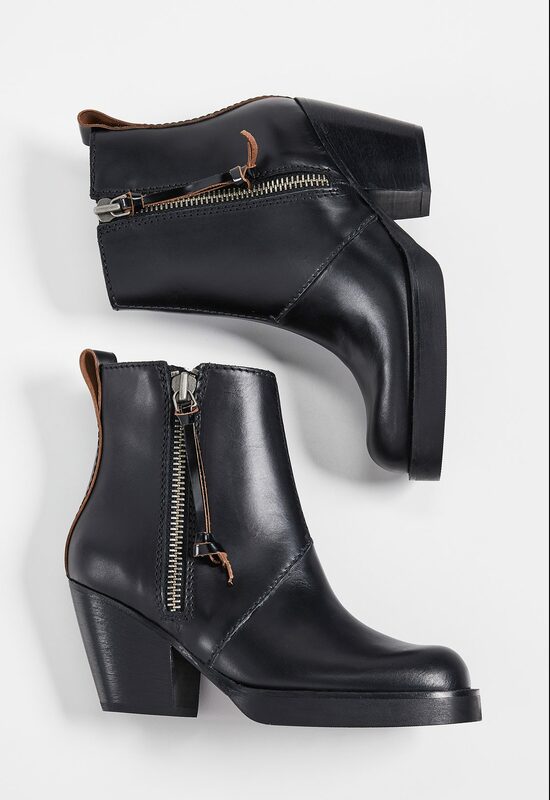 I live in Frye boots and they are worth mentioning- Their simplicity works well with pants and dresses + they last forever once you break them in. I have several pairs and I live in my dark brown Harness 8r’s love wearing them with dresses past the knee. 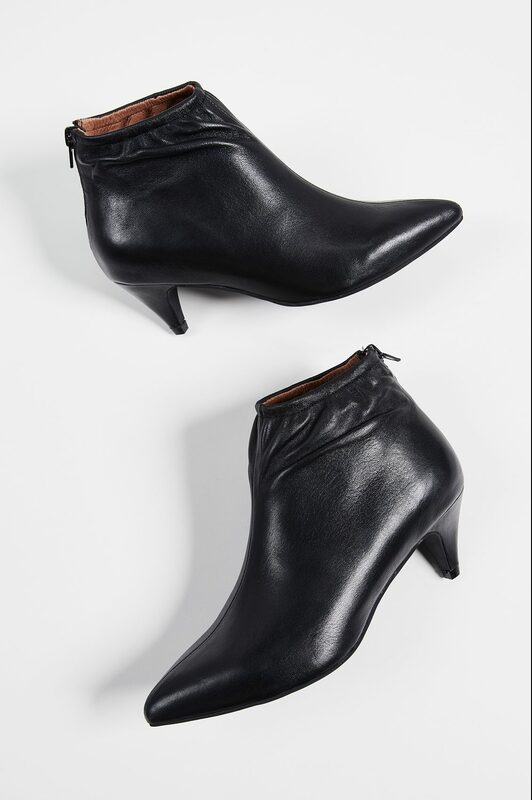 I live in Frye boots and they are worth mentioning- Their simplicity works well with pants and dresses + they last forever once you break them in. I have several pairs and I live in my dark brown Harness 8r's love wearing them with dresses past the knee. As a GOACA, I love boots but have bad feet. I wear custom orthotics and need a flat boot with a wide toe box. Any stylish options out there? The best I could find was by Vivobarefoot, except the soles are way too thin. I have messed up feet with horrible bunions and need a wide toe box, too. I’ve had the best luck with Nine West boots, which are fairly stylish. They had a desert boot and a moto boot, both of which I wore for years. Unfortunately, they have no good options at the moment, but I’d check back in a couple of weeks. I have the same problem(s). I wear Blundstone’s. Sort of chic in an ugly shoe sort of way. They also last. I have the same problem(s). I wear Blundstone's. Sort of chic in an ugly shoe sort of way. They also last. 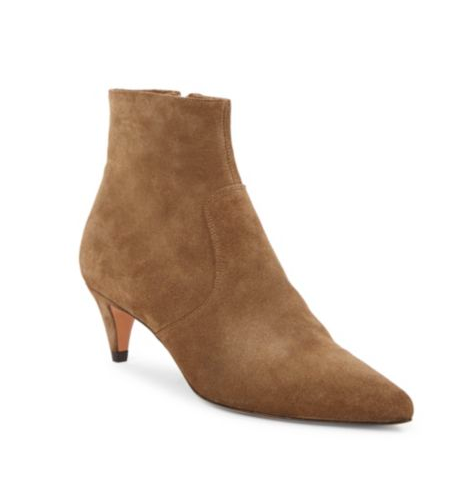 I have super sensitive feet, and I have been shopping for ankle boots for weeks. 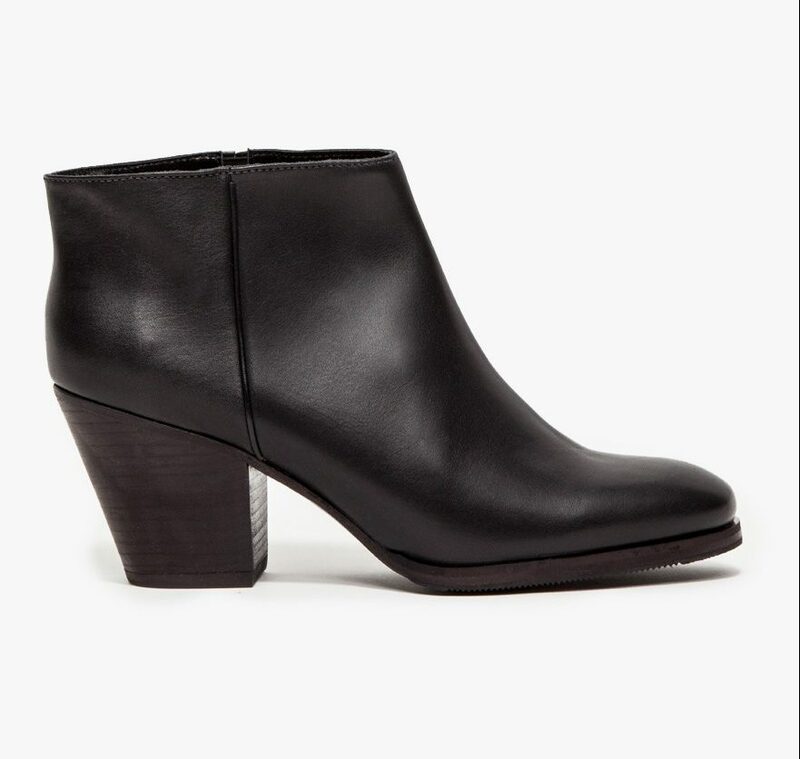 Most comfortable by far are the Paul Green Nelly bootie. Serious question about styling: do I really actually have to expose my skin if I wear short boots with pants? I hate that feeling in cool/cold weather … which is when we mostly wear boots, yeah? Serious question about styling: do I really actually have to expose my skin if I wear short boots with pants? I hate that feeling in cool/cold weather ... which is when we mostly wear boots, yeah? The Mary Poppins aesthetic is definitely in this fall. As a PWNF (person with narrow feet), I am thrilled to see boots that might actually fit. It’s quite the thing that being a GOACA brings the universal challenge of age-related foot problems. Mine is one fallen arch, not two. Trying on shoes used to be fun, but now it’s just interesting. I feel like one foot is trying to make me fall over sideways. The Mary Poppins aesthetic is definitely in this fall. As a PWNF (person with narrow feet), I am thrilled to see boots that might actually fit. It's quite the thing that being a GOACA brings the universal challenge of age-related foot problems. Mine is one fallen arch, not two. Trying on shoes used to be fun, but now it's just interesting. I feel like one foot is trying to make me fall over sideways. can’t find anything like them. I don’t like the cone heel. I seem to remember it was once noted that Acne boots are not comfortable but I do like that Pistol. 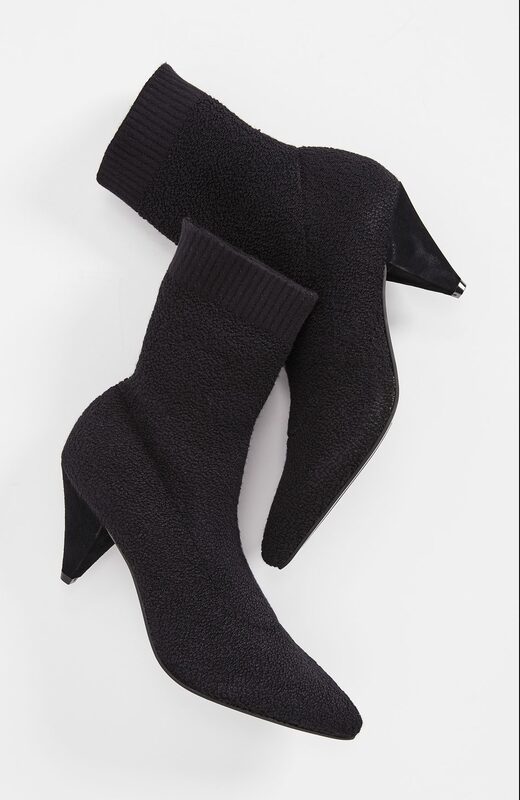 I'm still craving those Sandro sock booties from a few seasons ago... can't find anything like them. I don't like the cone heel. I seem to remember it was once noted that Acne boots are not comfortable but I do like that Pistol. Thank you for this wonderful selection! I live in boots and don’t mind spending a bit more if I wear them to death and they’re comfortable for walking around in all day. Thank you for this wonderful selection! I live in boots and don't mind spending a bit more if I wear them to death and they're comfortable for walking around in all day. What a great selection!! Thanks, Kim. I think I mentioned on an earlier post that there’s a need for extended-size options on footwear on this site, to match the laudable attention to plus-size clothing. The comments at the top here (which I’d totally echo for myself) once again bear this out. Being of a certain age means having wider, more troubled feet. You can’t just show a whole bunch of skinny little pointy-toe options and call it a day, lovely though they are. And finding shoes that fit and aren’t horrible “comfort shoes” is a serious style challenge. There are ways to do it, like finding ones that buckle across the top, or mules (which I find are excellent for wider feet), etc. It would be great to have some attention to this! 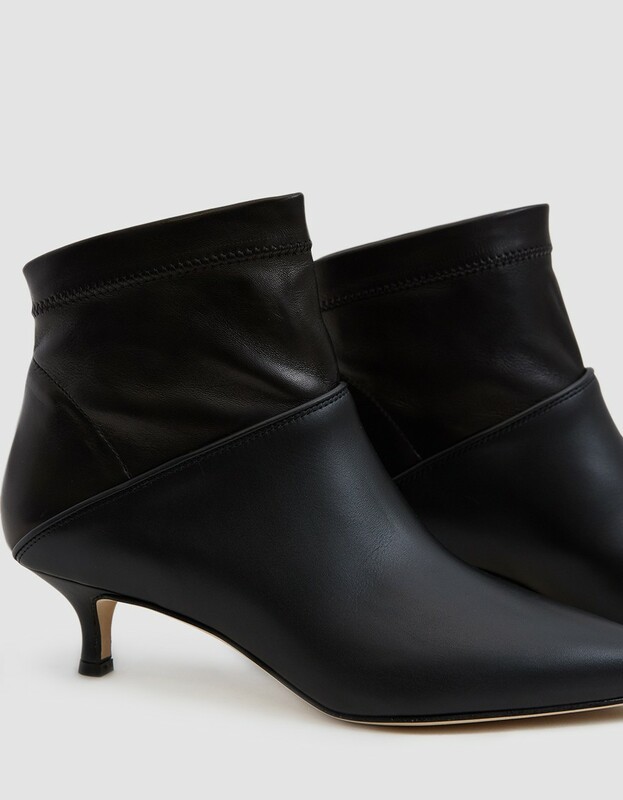 I think I mentioned on an earlier post that there's a need for extended-size options on footwear on this site, to match the laudable attention to plus-size clothing. The comments at the top here (which I'd totally echo for myself) once again bear this out. Being of a certain age means having wider, more troubled feet. You can't just show a whole bunch of skinny little pointy-toe options and call it a day, lovely though they are. And finding shoes that fit and aren't horrible "comfort shoes" is a serious style challenge. There are ways to do it, like finding ones that buckle across the top, or mules (which I find are excellent for wider feet), etc. It would be great to have some attention to this! Like you said, finding a shoe that looks good and *is* good is no easy task. Kim shows a lot of Chelseas and a decent amount of Birks and things. And what else is there that might fit this category? If you find out, please share with the class! I sympathize, Jen. I wonder though - and this may be impractical - couldn’t one just buy a pointy shoe in a bigger size and just stuff the toe? If one were determined to look “fashionable” that is? (I mostly don’t bother. In fact, when I walk through shoe departments lately, I don’t even see anything I want!!! I do not know what this means. Is it me or them?) Like you said, finding a shoe that looks good and *is* good is no easy task. Kim shows a lot of Chelseas and a decent amount of Birks and things. And what else is there that might fit this category? If you find out, please share with the class! The Acne Pistol is very uncomfortable for me – not sure why, just the heel height (which is not super high) and the footbed don’t work for me. Love the way they look. I have 3 pairs of Isabel Marant Dicker boots, one about to be retired. They are perfect for me and always lots on The RealReal to choose from! The Acne Pistol is very uncomfortable for me - not sure why, just the heel height (which is not super high) and the footbed don’t work for me. Love the way they look. I have 3 pairs of Isabel Marant Dicker boots, one about to be retired. They are perfect for me and always lots on The RealReal to choose from! I agree with the above posters who have issues with their feet. While the pointy boots are more stylish, I cannot wear any of them. They pinch my toes and my bunion. My job requires standing most of the day. 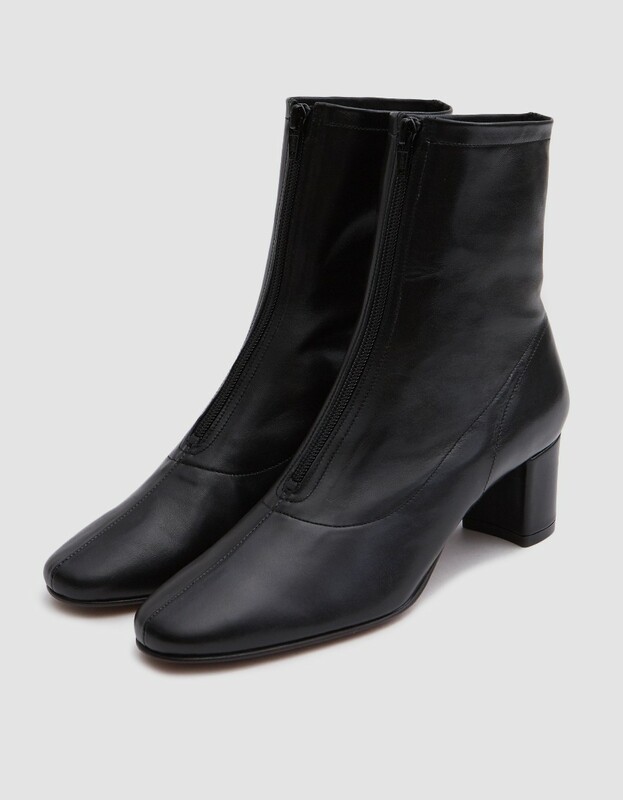 I would love a post on stylish but also comfortable shoes and boots.